What are picked and organically certified salad greens without a comparable salad dressing? Kelowna area based Donna Denison and husband, Dale Ziech may have asked themselves that question but even if they hadn’t, they provided the answer for other consumers looking for a delicious yet healthy alternative to what was available. Prior to embarking on her venture into commercial food production, Donna’s career involved making pottery. When she was unable to continue in that discipline, she turned her attention to making salad dressing. 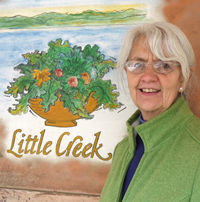 The 1990s was a decade of change for both Donna and Dale: in 1991 Dale began growing organic salad greens and four years later, in 1995, Donna launched her business Little Creek Dressing. The change in career direction has been a good one. 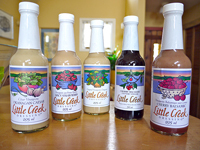 Dale markets his specialty salad greens primarily to restaurants while four variations of Donna’s salad dressings are being sold through several major British Columbia retail chains. In light of their growing popularity, she realized she needed to put a recognized food safety management system in place. “With the help of Small Scale Food Processors Association I developed better systems for Good Management Practices and that has resulted in my having more time. Because I was operating more efficiently, that helped in running my business. It’s the best thing you can do, having these processes in place for the sake of the retailers,” she says. Donna was upfront in acknowledging that a larger operation might see more immediate benefits but being part of the SSFPA program allowed her to purchase much needed equipment such as a commercial labeler (providing batch ID and traceability), computer equipment, a new date stamp and stainless steel tables. Donna’s also as quick to acknowledge that the program has provided more than “tools of the trade”, though, emphasizing that she’d already developed systems and methods on her own. With help she’s received from SSFPA she was able to upgrade those systems. “I learned so much. This gives you momentum and…shines a light by giving the awareness of those practices. It reminded me – I’d been doing them for so long and this gave a new awareness so that I could then work with the new systems,” she continues. According to Donna, there are times when small processors don’t have time to focus on details but she’s learned that something as simple as writing down what she already had been doing was helpful. Watch a short video interview with Donna Denison.